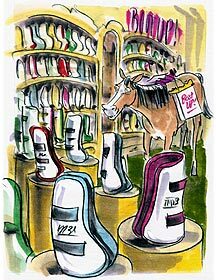 Your horse needs boots. Before you jump into the incredible variety available—skid boots, splint boots, interference boots, bell boots and ankle boots—and to avoid the confusion of trying to decide between these and all the combinations available, you should decide just what you need the boots to do. For example, if your horse will be standing on a shifting surface for a long period of time, shipping boots are ideal. They’re designed for maximum protection in these situations, and the best ones will cover the horse’s leg from the knee or hock all the way to the ground. However, they are only useful for exactly what their name implies—shipping and standing only. from blows from its other leg. They’re also good for preventing cuts and scrapes during jumps or cross-country rides. If your horse needs to feel a rub when jumping, choose an open-front design. For disciplines that require repeated sliding stops, consider skid boots. These protect your horse’s fetlocks during these maneuvers. If you prefer to leave the lower leg as bare as possible, choose ankle or interference boots. These protect the ankle and fetlock without covering the remainder of your horse’s lower leg. Bell boots and overreach boots help to protect the bulb of the heel and the lower pastern. These boots will sometimes prevent sprung or lost shoes. Bell boots come in a pull-on style which is useful for riding. However, remember safety. If your horse will wear bell boots when it is unsupervised in the pasture, make sure to use a style with Velcro closures. This will allow the horse to get free of them if they become entangled. Boots are also available in many different materials. From traditional leather to high-tech composite materials, and lined with anything from natural fleece to nylon, even the fastenings vary—buckles, snaps, and Velcro. The higher-tech the materials, the more the boots will cost, but before you let price become your deciding factor, consider the amount of time and effort you want to spend maintaining the boots, as well as the time it takes to apply and remove them. For example, leather splint boots with buckles and fleece linings take longer to apply and remove, and if they become dirty, they can be difficult to clean. However, a more expensive set made with neoprene and Velcro are quick to remove and can simply be hosed off to clean. To ensure that the boots fit your horse comfortably, keep the linings smooth, clean, and free of grit. Also, proper fit and application of the boots is essential to getting the benefit of using them. An incorrectly applied boot can do more damage than good. If it is too tight, it will cut off circulation to the foot, while a loose boot can slip and impede the foot. Make sure that the pressure from the fasteners is even along the leg, with no tight or loose spots to bind or rub. A boot that is the wrong size will never fit correctly. If you’re unsure which size boot to purchase, consult a professional who is knowledgeable about the boot to help size it and show you how to correctly apply it. Practice putting the boot on with supervision until you are sure you can do it right. Some boots may come with instructions you can consult, as well. Read the next horse tack article on Horse Blankets.